This article is by Dr Paul Watt. Paul teaches musicology at Monash University, Australia, and his many research interests and publications included street music and musicians. London in the 1800s. Buskers (called “street musicians”) were met with fierce opposition by some, but with sympathy by others. For many social commentators, street musicians were just another source of “noise”. 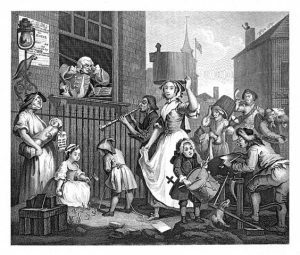 At the time, the streets were full of the noise: of horses’ hooves on cobbled streets and the shouting (called ‘crying’) of costermongers selling vegetables, fruit and fish. For some, bands and singers were considered to be just another source of annoyance. Hogarth’s 1741 engraving The Enraged Musician. Yet although street musicians were part of a historical and rich sonic soundscape, arguments about “noise” versus “sound” persisted. There is strong evidence that many people enjoyed street music and didn’t find it “noisy” at all – indeed, that this new classification of the sounds of the street came from a wealthier class of people who simply didn’t identify with nor engage with entertainments of this kind. The main noise-producing culprits were barrel organs. In many studies there is evidence of hundreds if not thousands of them across London, and some were only a short distance away from each other. They often started playing as early as 8 in the morning and were still going at 10 at night, especially during the summer. And then there were out-of-tune bands. This was a period before the international unifying of instrument pitches, when instrument notes were at different frequencies (i.e. a “C” note on one instrument may not match the “C” note on another), so bands from different countries, or bands comprising soloists from other countries, would not be playing at the same pitch. It would sound like a choir singing out of tune. No wonder people complained! Naturally, the last thing the Royal Academy would want to do is regulate street musicians, and rounding up bagpipers and their instruments was both ridiculous and impossible. Shaw’s humour helped take the sting out of those who were hostile to the buskers. He kept busking alive. Were street musicians noisy? It depends upon who you ask. An article from the Examiner in the 1860s argued it was “servant-maids and pot-boys [that] enjoy the hideous sound miscalled music”. But not everyone was such a snob, nor quite so classist. Just as Shaw wrote that street musicians had rights, the writer Reginald Haweis, writing in 1871, of the importance of street music to society, and that one day in the future street music: “will be understood as important factors in the life and morality of the people”. With increasing research on the impact and historical relevance of street music, it seems like scholars beginning to agree with Haweis’ statement. Examiner article is cited in Michael T. Bass, Street Music in the Metropolis: Correspondence and Observations on the Existing Law and Proposed Amendments (London: John Murray, 1864), 92. George Bernard Shaw, ‘Street music’, Dramatic Review, 2 January 1886. Reproduced in Shaw’s Music vol. 1 ed. Dan H. Laurence (London: The Bodley Head 1981), 437–40. H.R. Haweis, Music and Morals (London: Strahn and Co, 1871). David Hendy, Noise: A Human History of Sound and Listening (London: CCCO Books, 2013).